The fire that took place today at the Heydar Aliyev Center in Baku caused no damage to the inner part of the building, halls and others, a joint statement of Emergency Situations Ministry and Azerbaijani Prosecutor General's Office says. 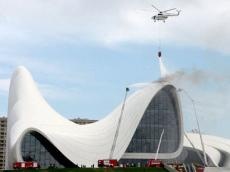 Information was received about a fire in the ceiling of the museum part of the Heydar Aliyev Center in Baku at about 11:30 on Friday. Personnel, vehicles, machineries and helicopters of the Emergency Situations Ministry were involved in the scene immediately to extinguish the fire, cause of which is unknown yet. The fire was extinguished, and the fire was prevented to spread to inside of the building. Except the ceiling of the Heydar Aliyev Center, the inside, halls and other parts of the building did not suffer damage. At the same time, none of firefighters and security employees of the building was hurt. As a result of the fire that took place at the Heydar Aliyev Center in Baku today no damage was caused to inner part of the building, halls and others, a joint statement of Emergency Situations Ministry and Azerbaijani Prosecutor General's Office says.